FCC Communication Cabling partnered with Aliant to complete the voice cabling infrastructure for the new offices of Revenue Canada in Moncton, NB. A category 5 enhanced solution was proposed and installed in order to provide future bandwidth expansion. 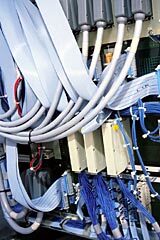 Category 5 enhanced is now the minimum standard for data network cabling and is fast becoming the minimum for Aliant’s new voice installations.